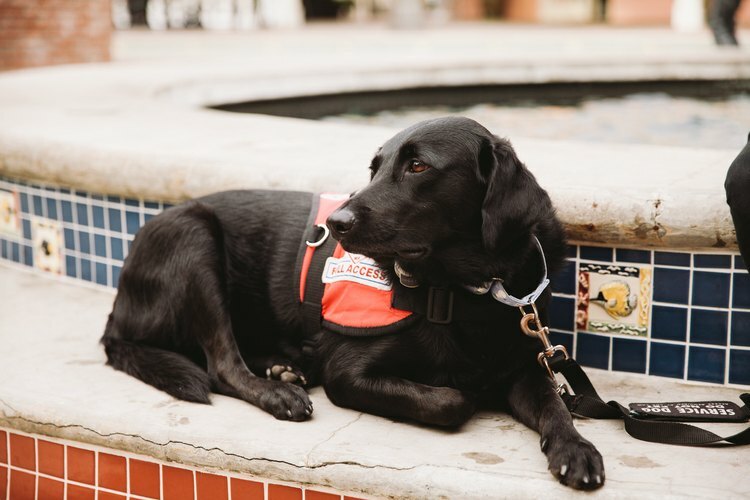 Dogs don't usually get to go to Disneyland, but for Moxie, a diabetic alert dog, wading through the crowds and riding rides at the Happiest Place on Earth is just part of the job. 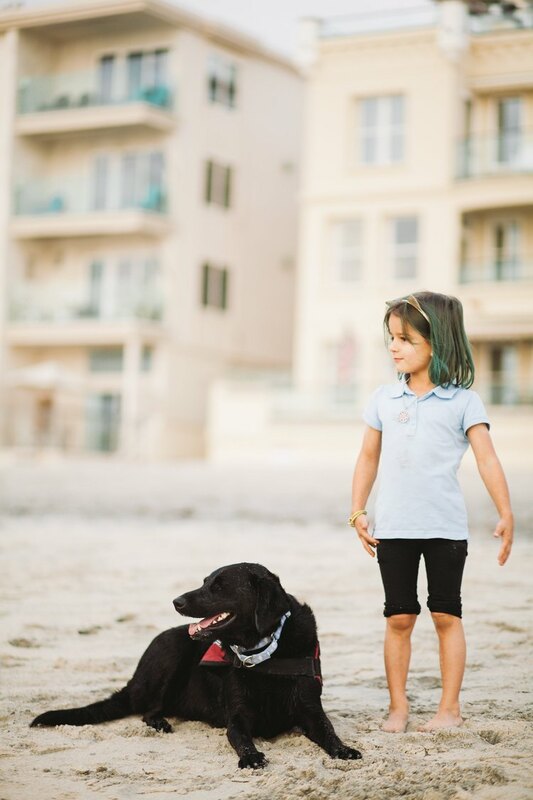 Moxie works as a service dog, helping monitor 5-year-old Juniper, a little girl with Type 1 diabetes. 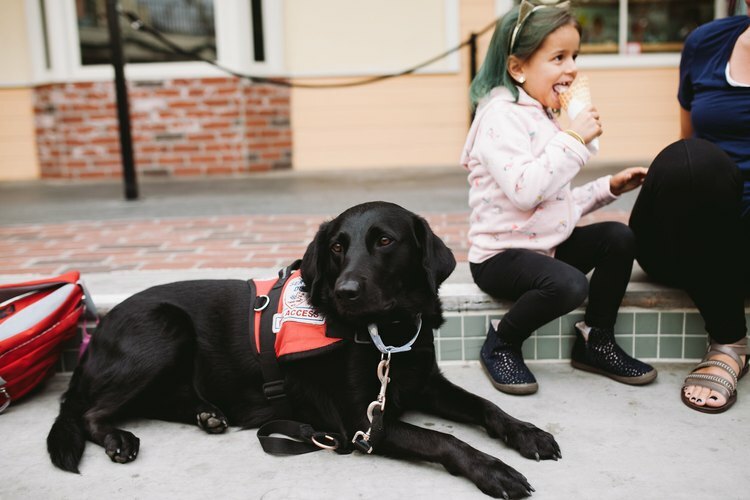 "She's pretty much game for anything," Juniper's mom, Lisa Pool, explains about the 3-year-old black Labrador retriever, whose gleaming black coat contrasts with her bright red service-dog vest, and that includes their recent family trip to Disneyland on a 100-degree day. "You think you attract a lot of attention with five kids and a service dog, but then having a service dog with shoes," exclaims Lisa. "Everyone was talking about her shoes." Moxie spends her days by Juniper's side, because she's trained to detect when Juniper's blood sugar goes above or below the normal range, even at Disneyland. Easing into an outdoor table at a local Starbucks in Oceanside, California, Juniper's older sisters, Penelope, 10, and Adelaide, 7, introduce themselves and Moxie. All three sisters have matching teal color added to their hair, which Adelaide tells me they did together. As we talked, Juniper was feeling shy, so she clung near her mom and her beloved Moxie, who lay calm and relaxed. But in a moment, Moxie's demeanor changed. She stood up, face focused, nose in the air. Then she sat decisively in front of Lisa and nudged the mother's knee with her paw. Moxie had just "alerted" Lisa that she sensed Juniper's blood sugar was out of the normal range. Lisa pulled out Juniper's brightly patterned testing kit to test Juniper's blood sugar levels. Moxie was right. Juniper's blood sugar had fallen low, so she drank a juice box. Type 1 diabetics have to regulate their blood sugar levels carefully throughout their lives. According to the CDC, approximately 1.16 million Americans live with Type 1 diabetes, and about 15,000 kids and young adults are diagnosed with Type 1 diabetes each year. This autoimmune disorder can hit at any age, and it causes a person's immune system to attack the pancreas, destroying the organ's ability to make insulin. Our bodies need insulin to regulate our blood sugar. The pancreas releases insulin, which circulates in the body and allows glucose from the blood stream to enter our cells, where we can use it for energy. Without natural insulin to help move glucose from the blood stream to the cells, Type 1 diabetics must constantly monitor their blood sugar levels and inject the right amount of insulin, usually in the form of several insulin shots daily. They also have to carefully monitor their lifestyle including diet and exercise, which can all affect their blood sugar. And the stakes are pretty high, because blood sugar is unpredictable and patients with diabetes live in daily danger of falling into a coma due to blood sugar changes. If blood sugar drops too low (hypoglycemia), it can lead to seizures, coma, or worse. And if blood sugar rises too high (hyperglycemia), diabetic ketoacidosis can set in, where the body burns fat for energy, because it can't process glucose. All these health concerns mean that Type 1 kids have a much higher rate of hospitalization than other children, which can be tough. Last holiday season, Juniper got a severe infection in a cut on her forehead, and she spent 10 days in the hospital. "Moxie was with her the entire time. Everyone knew Moxie at the hospital. She laid on Juniper's bed the whole time, didn't want to leave her," Lisa remembers. 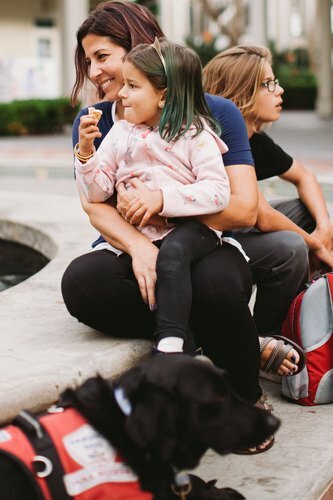 "We had to force Moxie to go home a couple of times with my husband to sleep, because she would stay awake all night long." But that's why Moxie makes such a big impact on Juniper's life and struggles — she's there through all the tough days as a comforting force for the young girl. 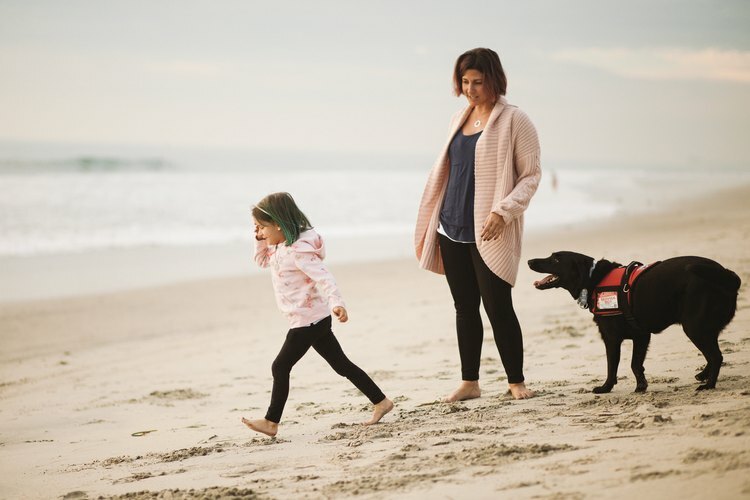 "It's not just for the medical alert aspect, but just to have Moxie always there with her," Lisa explains. "There's that comfort factor of your best friend that goes everywhere with you." 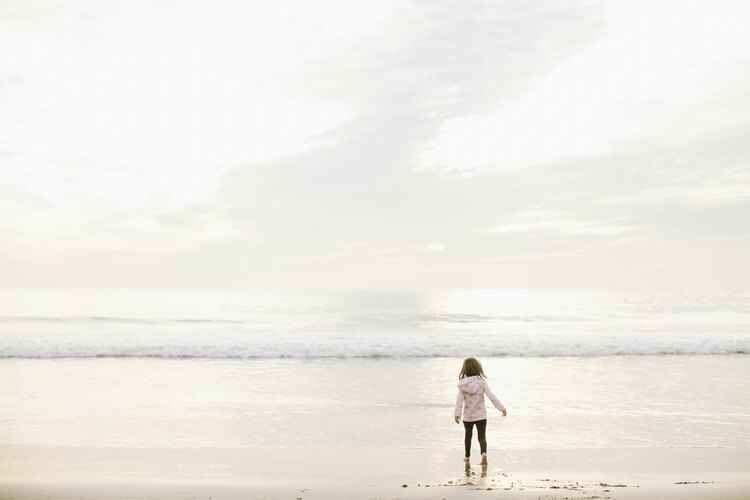 Juniper was diagnosed with Type 1 diabetes shortly after her second birthday. Lisa emphasizes that they weren't aware of the symptoms of Type 1 diabetes or how quickly it can become dangerous. And Lisa insists there still isn't enough awareness. Managing a Type 1 diabetic's insulin is always tricky, but with a child as young as Juniper, it's even trickier. "Insulin's a funny thing," Lisa explains. "It saves her life. Without it, she wouldn't be here. But just a small amount too much, and it can kill her." Which is why Lisa felt almost immediately that the family needed the support of a service dog. 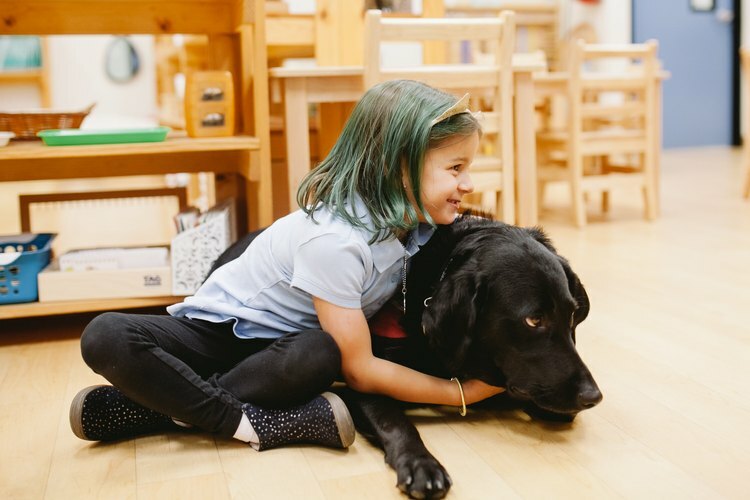 Diabetic alert dogs are highly trained service dogs, and they can be a huge help, particularly for Type 1 patients. 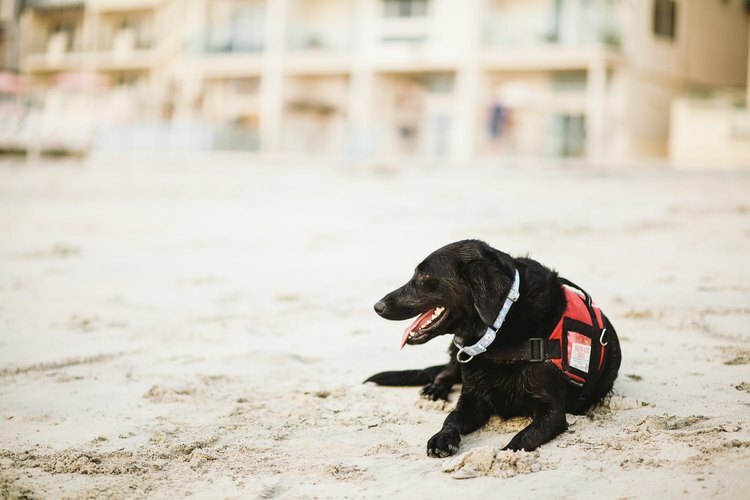 Diabetic alert dogs are a type of medical service dog specifically trained to alert patients when their blood sugar has risen above or dropped below a safe level. 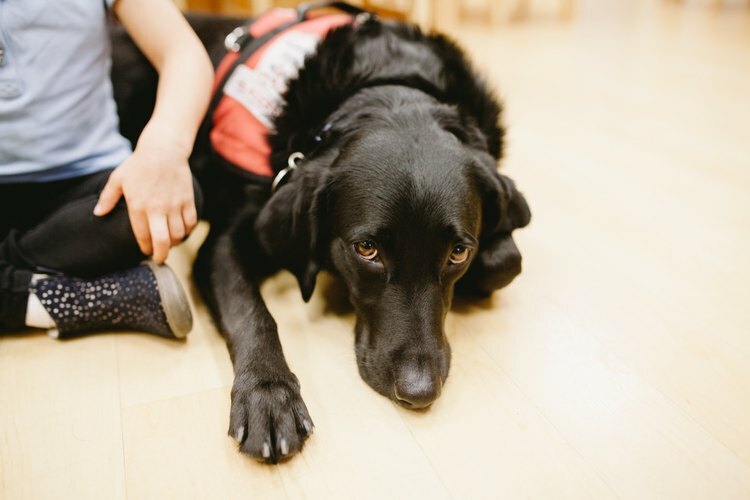 Unlike other service dogs like visual assistance dogs — who help their handlers navigate the world around them — diabetic alert dogs keep their focus always on their human, waiting for a whiff of blood sugar fluctuations. 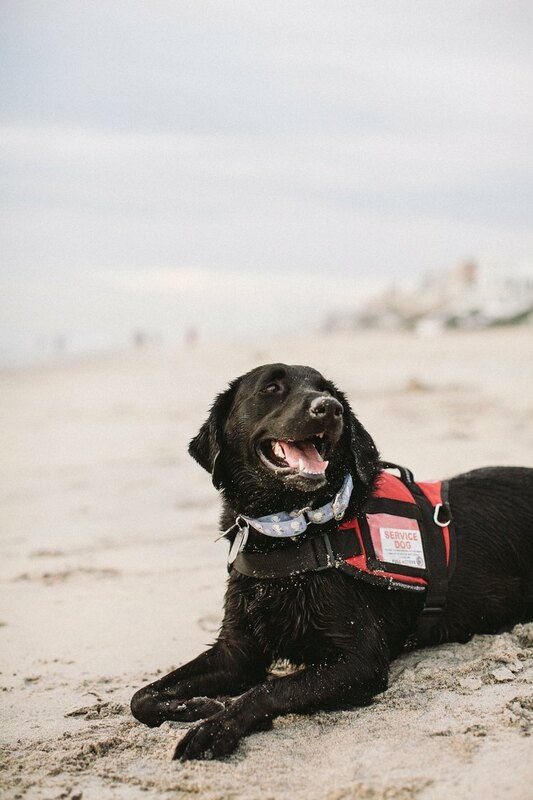 While diabetic alert dogs could be used by either Type 1 or Type 2 diabetics, they are typically used to help Type 1 patients. Crystal Keller, a trainer at Canine Hope for Diabetics, a company that trains diabetic alert dogs, explains that these dogs work for Type 1 patients because their blood sugar fluctuates more often and with more severity than a Type 2 patient's typically does. 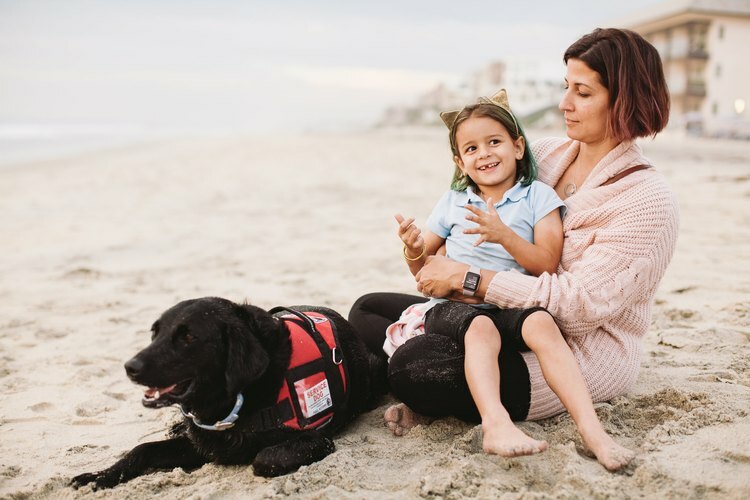 She adds, "Type 1 patients test more often and typically have a more aggressive form of management," so they need the kind of constant monitoring that a service dog provides. For a family like Juniper's, it means they need any help they can get. "The goal of the dogs is to bring the handler down to a level of management to help preserve long term health," Crystal points out. According to Crystal, a dog takes approximately 18 months to 2 years to train, so long waiting periods are common. Juniper's family waited about a year to get Moxie. Crystal explains that dogs are trained using positive methods and playing scent games to detect specific smells, similar to a drug or a bomb sniffing dog. In this case, they are trained to detect the acetone smell when a human's blood sugar is low, and the syrupy smell when a human's blood sugar is high. Most importantly, dogs can be trained to a specific diabetic's scent. Moxie was trained specifically for Juniper. When Juniper's blood sugar hit certain levels, Lisa or her husband swabbed her mouth and froze the saliva samples to send to Moxie's trainers in Arizona. "She was trained specifically on June's scent, even though she had never met her," Lisa explains. "So within about 10 minutes of meeting each other, Moxie alerted to a low blood sugar. Which was really amazing." However, though diabetic alert dogs have incredible detection skills, owning one isn't always easy. 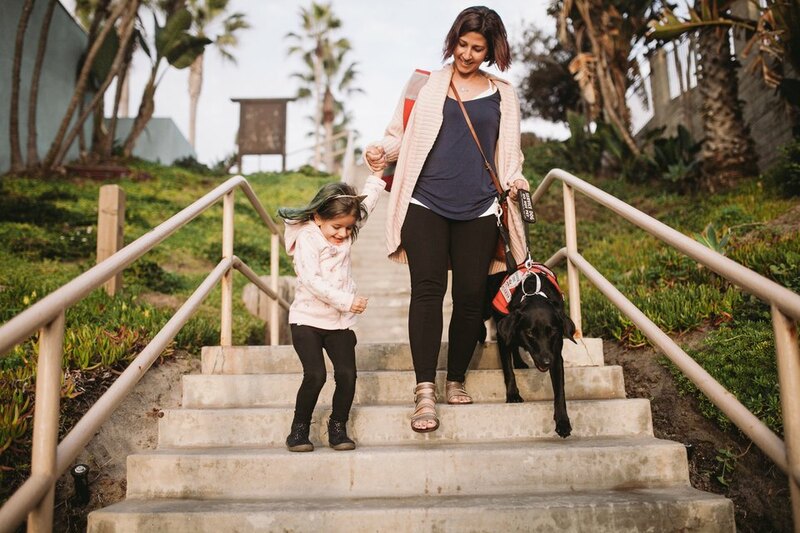 First of all, just the training can be enormously expensive, so diabetic alert dogs commonly cost around $15,000 to adopt, although many companies offer scholarships for families with financial need. And even once the dog is a member of the family, they require a lot to keep them sharp. Lisa and her family constantly work to keep Moxie up on her training. "We're always practicing scent samples with her, just to keep her fresh. We've noticed that if we get lazy, she gets a little lazy. So we're always practicing and working with her." And dogs aren't infallible. They need rest, and even Moxie occasionally misses stuff. That's why Juniper also has a continuous glucose monitor, which also monitors her blood sugar levels. Lisa explains, "You can't expect perfection out of a living animal, and we definitely don't expect it of technology. So I think they meet up in the middle, and we miss a lot less having the both of them. We rarely miss completely. I would never give up either one. But if I had to give up one, I would give up the monitor. Moxie is more accurate than the monitor is." Now that Juniper is in school, having Moxie adds an extra layer of security. 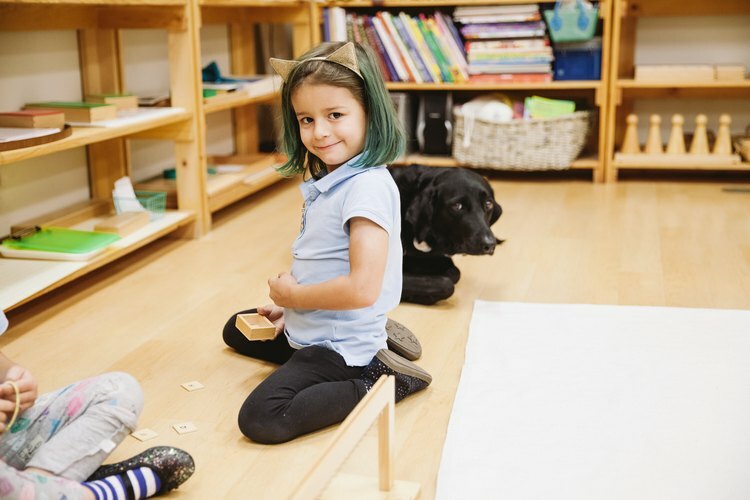 Juniper loves going to school with Moxie, and school loves Moxie back. "Her teachers love Moxie," Lisa says. "They treat her really well, and they take her for walks at lunchtime." Juniper also whispers shyly that she loves playing with Moxie and snuggling with Moxie. After Penelope proudly shows me a photo of Moxie in full belly rub mode, Lisa explains with a chuckle, "She does a good job, and she's well taken care of for it. She's well compensated." "Moxie is always working to help keep our girl safe. I don't know that we can ever really repay her for the countless times she's helped Juniper to keep her healthy and safe. 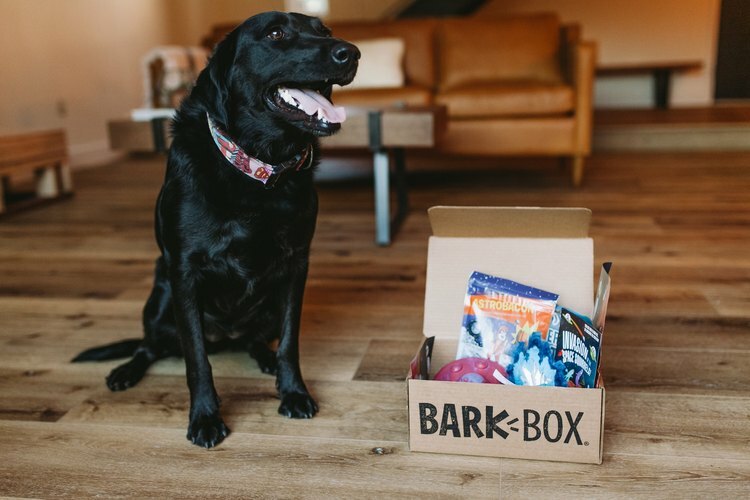 BarkBox is a great way for us to show her how wonderful she is. She loves the special treats and always goes crazy for a new toy." Just two years into their life together, Moxie has made such a huge impact. 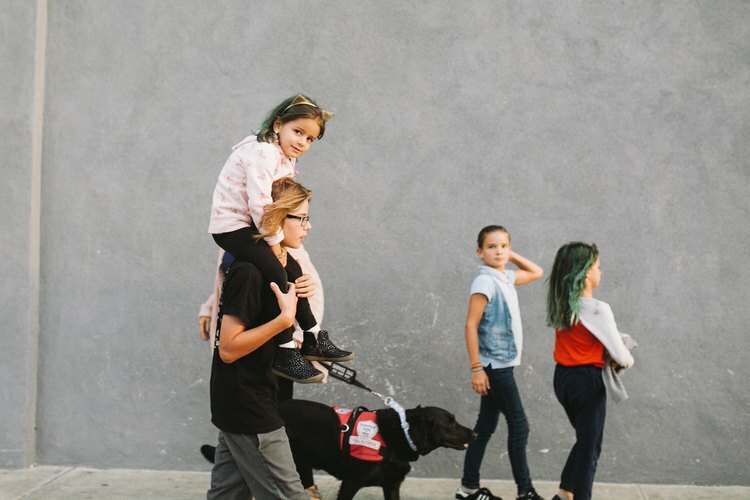 As Juniper wraps her arms around Moxie's neck, the two demonstrate so perfectly what a service dog can do for a family, both medically and emotionally. And everywhere they go, Lisa loves to see the positive response that Moxie gets, even in busy places like Disneyland. "This was our first time at Disney, and I was impressed with how amazing they were," Lisa recalls, reflecting on how the cast members at Disneyland were able to accommodate a service dog. "Moxie went on all the rides except Space Mountain and Big Thunder Mountain," Lisa says, still impressed by the dog's adaptability. "Pirates of the Caribbean, there's a big dip, and she was like, 'Oh, what's this?!' But we got passes, and then we went back like two weeks later. She's a pro at it now." Watching Moxie calmly but firmly alert twice to Juniper's low blood sugar over the course of our conversation, it's hard to imagine there's much of anything that Moxie isn't a pro at. She and Juniper clearly have a special bond, the kind that sometimes only humans and animals can have. "She's such a big part of our life now," Lisa declares. "It's hard to imagine them not together." 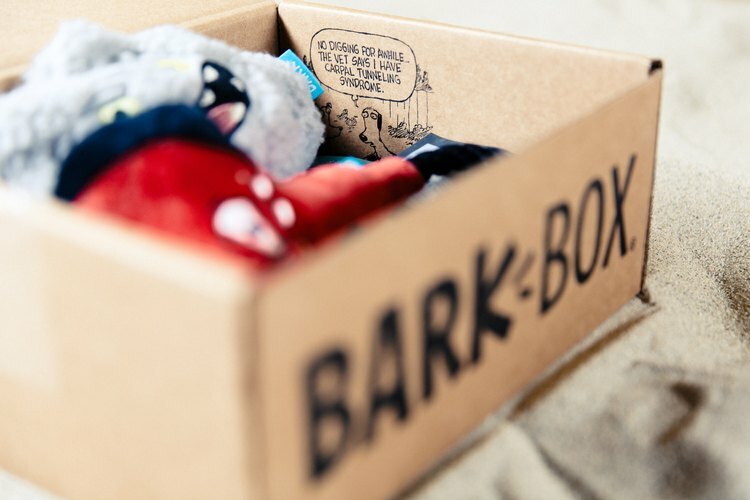 BarkBox is a monthly subscription of dog toys and treats, dedicated to making all dogs happy. They recently surprised Moxie, a Labrador retriever, after graduating from her diabetic alert dog training. 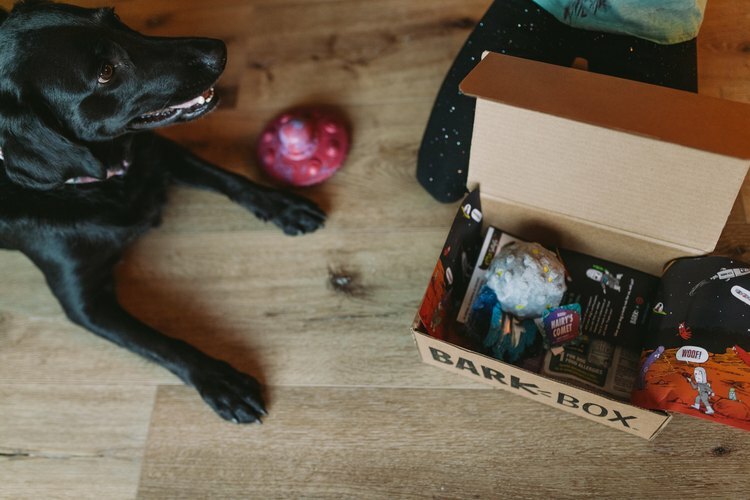 BarkBox is committed to thanking pups, like Moxie, who make the lives of their humans better.